Tamarindus indica Linn is used as traditional medicine for the management of diabetes mellitus. 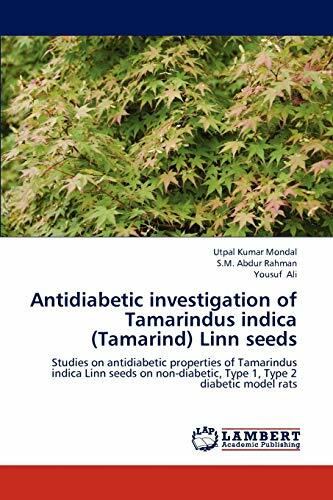 The present study has been undertaken to screen the hypoglycemic and anti-hyperglycemic activity of Tamarindus indica seed powder in nondiabetic and both Type 1, Type 2 diabetic model rats. Our results demonstrate that T. indica seed powder possesses significant antihyperglycemic activity in Type 2 diabetic model rats. The antihyperglycemic activity is at least, partly due to inhibition of intestinal glucose absorption. This effect cannot be attributed to the acceleration of intestinal transit. However, comprehensive chemical and pharmacological researches are required to find out the exact mechanism of this seed powder for its antidiabetogenic effect and to identify the active constituent(s) responsible for this effect. Utpal Kumar Mondal, Completed Master of Pharmacy from Dept. of Clinical Pharmacy &amp; Pharmacology, University of Dhaka. Currently, He is working as a Lecturer at Northern University Bangladesh (NUB). Research Area: Diabetes, Phytochemistry &amp; Natural Products.